VR Business Brokers, a franchise group with 165 offices throughout the US, had a challenge maintaining brand identity. As a franchise organization, they needed to allow their sales offices to uniquely identify themselves. As an up-and-coming brand, VR needed to control the logo and message to continue strengthening its position in the market. How do you balance the need for individuality while keeping a consistent image? Proforma recommended PROecom, a comprehensive eCommerce solution to fulfill all of VR's needs. PROecom accommodates more than promotional products, it features a variety of print capabilities, including static, personalized, variable data and custom 1:1 marketing pieces. 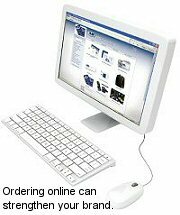 PROecom maintains inventory levels and provides real-time reporting. VR is ecstatic, PROecom has allowed them to consolidate purchasing, practice efficient inventory control and maintain identity standards. By centralizing the purchasing and branding of promotional products, VR representatives can easily purchase items online at low prices. The VR Store provides a variety of template items from business cards, letterhead and envelopes to letters, postcards and other direct mail pieces. VR reps have the option of customizing specific information, but the template determines the layout and images used, thus guaranteeing that corporate identity standards are maintained. To conduct a brand-compliant mailing, the representative simply customizes the template, uploads contact information, and the mail pieces are 4-color printed, folded and mailed on the representative's behalf. Streamline your order processesing. Gain better control of your inventory. Maintain your identity standards. contact us today.